UPDATE: The Ticket 97.1 retracted this story because it was an off-air conversation between personalities at the station that bled onto the air. Allegedly, this discussion was a "what if" scenario with an NBA trade involving Kawhi Leonard being moved to Toronto; a location where it's unlikely that he will sign with. Regretfully, a mention of the below trade rumor was aired in regard to "irresponsible management" where teams will trade for players that may refuse to sign. With news breaking that Columbus superstar Artemi Panarin wouldn't discuss a contract extension after training camp starts in September, the rumors have been flying where he might end up. While fans and analysts alike have chosen Toronto or San Jose as the likely landing spots for The Bread Man, I will relay a scenario here that is being discussed in Detroit. Are you ready for this potential blockbuster? According to The Ticket 97.1 FM in Detroit, in total, there are nine pieces in this supposed looming and discussed deal among three teams. In no particular order, these teams are the Columbus Blue Jackets, the Detroit Red Wings, and the Montreal Canadiens. Once I mention the players that are being batted around, this indeed would be a shocker of a blockbuster. While there are some big names being thrown around here, there is also a lot of head scratching as to why. Dylan Larkin is a restricted free agent and has said that he was willing to take the "home town discount" to stay in Detroit. Reports suggest that Larkin is expecting similar contracts to what Boston gave David Pastrnak and Winnipeg gave Nikolai Ehlers which is between $6 and $6.66m AAV. 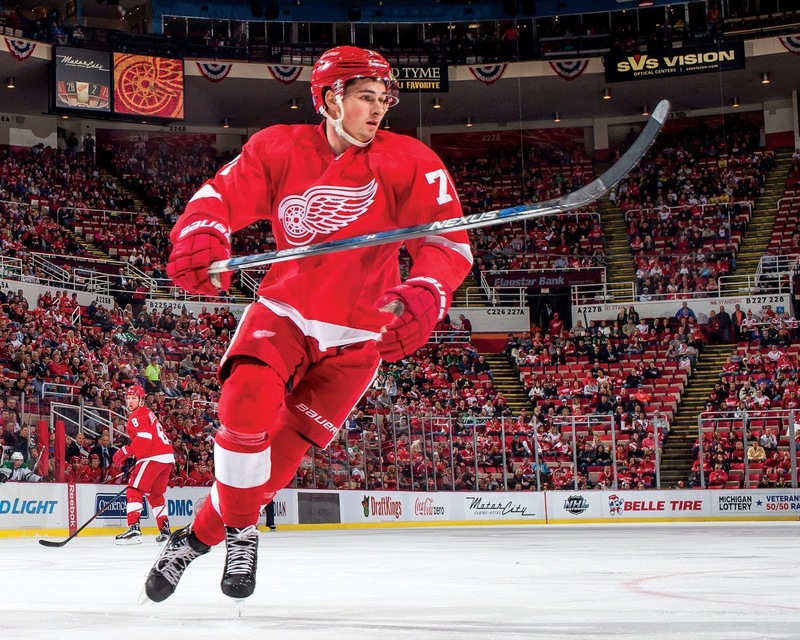 With what is being reported, Larkin's status wasn't listed as "the rights to" so it may mean that if this were to come to fruition, Detroit may sign and deal him. Detroit also recently signed Andreas Athanasiou to a two year deal, but there has been no secrets as to how they feel about his play in his own end. The head scratching for the Detroit perspective is why would they make a deal that would only make them older? Sure, they'd get what would be an eventual backup goalie in Lindgren and a young(er) defenseman in Ryan Murray who has yet to live up to his second overall pick potential in 2012. Montreal would definitely get a bona fide scorer in Panarin to replace the departure of Pacioretty which was inevitable anyhow, but to deal away a good defensive prospect in Noah Juulsen as well as a first round pick in the 2019 draft while still rebuilding is a questionable move despite gaining a second round pick in the same draft. However, is Montreal a location that Panarin would want to sign an extension in? Panarin has said that his girlfriend wants to start a modeling career in a larger city that would make those aspirations a possibility. Having been to Montreal a number of times, I know the city is fashion forward, but not in comparison to New York City or Los Angeles which may have been what Artemi was hinting at. Columbus would be the clear cut winner here, in my opinion. They get a potential first line center in Larkin to replace Alexander Wennberg, a speedy and fun to watch Athanasiou, another young talented defenseman, and a first round pick. If this deal takes place, Columbus will be receiving a lot of attention. NOTE: Although it wasn't specified what their destinations would be, it is reported that Justin Abdelkader and Boone Jenner could be included in this trade proposal.